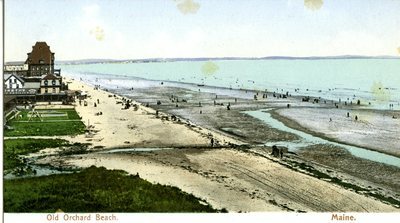 "Old Orchard Beach Postcard "
An image scanned from postcard of Old Orchard Beach, Maine. The tide is out and people are walking on the sand and some are in the ocean swimming. There are houses and business along the ocean. The card includes the printed number 5328.